The fabric for this dress had been cut for over a year. I started sewing it, but couldn't stitch the hem the way they had instructed in the pattern (Butterick 4967). But then I read about the roll hem option on the serger and gave it a try. LOVE IT! I was afraid that Mea would not like this dress because of it's color. But she didn't want to take it off today. It must be the frills. I also sewed this Rapunzel dress for Mea using my serger. The colors are a little off in this photo, and it looks so much cuter on her, too. I'm hoping it holds up better than some of her other princess dresses because of the serged seams. I used Simplicity 2569 for this dress. 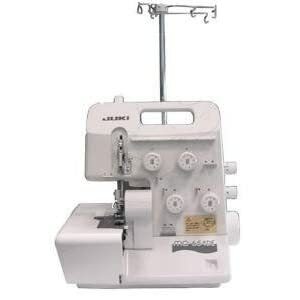 I LOVE my Juki Serger! It is seriously one of my favorite things I own. :) Happy sewing to you - I wish I sewed as much as you do... you are amazing at it!